To me, getting to April means we’re in the middle of performance season – and anyone who knows me knows that this is my favorite time of year! 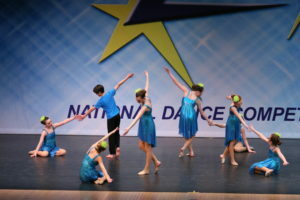 Recital is my absolute favorite thing – and competitions plus the final preparations for recital in classes keep the studio buzzing with excitement. Our Company is having an incredibly successful season so far – we’ve competed in two regional competitions, and have two more to go! We will be competing this weekend in Cedar Rapids at the Paramount Theatre! Competitions are free to come and watch – we have dances on Saturday, April 7 pretty consistently between 10 AM and 8 PM. We would LOVE to see you and your dancer there to cheer on our team! Any dancers who are thinking about trying out for one of our performing groups next year are invited to come check it out – see what being on one of our teams is all about! Company and our new community team are open to dancers age 6 and up! Dancers do need to audition to earn a spot on either team – learn more about auditions and what being a member of these groups is all about on our Community Team page and Company page! We’re in the middle of all things recital – the last costumes should be arriving in the next couple of weeks, we’ll be opening up recital t-shirt and flower bouquet sales very soon, our FIRST Father-Daughter dance will start to rehearse soon, and we’re starting to build our recital program! Dancer shout-outs and business ads are available – check out the recital page for those order forms! We know families are busy – if you’ve noticed the sign in the parking lot but aren’t sure what’s going on, check out our big news on the blog here. As we get ready to wrap up this school year and move in to summer dance (have you signed up for classes and camps yet?! ), thank you for being a part of our dance family at The Pointe. I am so thankful for each and every one of you! Every dancer here, from our first-time-dancers in Mini Movers to our dedicated Company kids who seem to see their dance teachers more than their parents some weeks, has a unique role in our community and is so important. Sunday, June 10: RECITAL 2018! View all of the important dates for the school year including Recital 2018 on our schedule, here. Recital 2018 Details – Now Available Online! Our Recital 2018 page is up and running – and full of great information! www.thepointeschool.com/recital-2018 is the best source for recital information. We’ll email information home, and post it on this page to help busy families have one place to go with all of their information together. 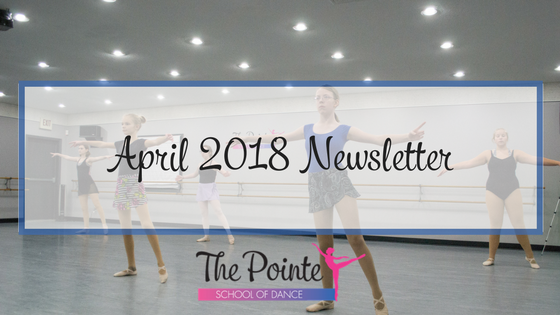 On this page – our Recital Handbook, Picture Week/Studio Dress Rehearsal Schedule, Dress Rehearsal Schedule, and order forms for Business Ads in the program and Dancer Shout Outs! Our Recital Programs are beautiful, full-color keepsakes for your dancer and visitors who come to the recital! Make your keepsake program extra special by including a “Shout-Out” for your dancer in the program book! Orders for Shout Outs (and business ads – a GREAT way to get your business seen by great local families!) are online on our 2018 Recital Page and due April 25. Graduating high school seniors receive a FREE shout out with an image – parents of graduating seniors, please fill out the same online form and note that it is a “Senior Shout-Out” – we’ll get it in the program book and will not charge your account. Every dancer will receive one complimentary program when they check in at recital and additional copies will be available for sale (just $5!) in pre-orders before recital and a few extra copies will be on hand at the event. Our website has had a few little adjustments recently to make information for our current dancers easier to find. 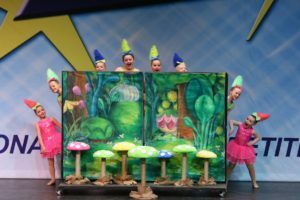 When you visit www.thepointeschool.com – everything our current families need is under the “Current Students” tab. Find links to recital information, parent portal login, and more through that link! Company and Community Team Information & Audition Sign-Ups! We are thrilled to announce our brand-new Community Team program designed for the dancer who wants to perform more throughout the community! Dancers who are interested in more performances and being a part of a productive and positive dance team should check out our Community Team (performance group) and Company (competitive group). Dancers who eat, sleep, and breathe dance can absolutely participate in both – in fact, we encourage it! Learn more about Community Team here. Learn more about Company here. Our new foundation is a 501(c)3 charitable organization seeking to provide dance education opportunities for students with financial need. We have big goals to provide scholarships and outreach programs to bring the joy and power of dance to as many Cedar Rapids area students as possible in 2018. We are currently seeking business and individual partnerships to help make this possible. Did you see our March Dancers of the Month? Read more about these amazing dancers here. Please do not bring sick children to dance class – if your dancer has a fever, please do not bring them to class until they have been fever-free for at least 24 hours. Dancers can make up any missed class due to illness by attending a similar level class any time within two weeks of their missed class. Check out these great photos from our first two competitions!